Live Music at THE BEBOP MUSIC HOUSE: Boston's Best Brand New Stage: Bebop Booking Details! Welcome to THE BEBOP MUSIC HOUSE located at 1116 Boylston St, Boston, Massachusetts 02215. A brand new open stage where artists can sign up to showcase their music! The Bebop (www.bebopboston.com) is owned by musicians Tommy & Louise who opened The Burren (www.burren.com) in Davis Square, Somerville, 21 years ago so friends and family could have a wonderful place to play. Now they're bringing that tradition to Boston! 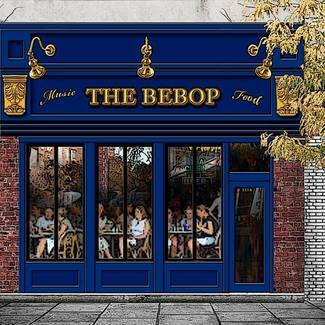 The Bebop is a music venue that attracts musicians from Berklee, Boston Conservatory, New England Conservatory, and other neighbors. A place for great music, all day, everyday. Our food and drinks are awesome too, so it's the perfect place to call home with your friends and family! We focus on acoustic music and acoustic genres (americana, bluegrass, folk, singer/songwriters, world music, jazz... you get the idea!) The stage hosts up to 3 or 4 artists at a time. There is a full PA system here for you. Acoustic instruments are what we're looking for during the day. Upright bass, violins, mandolins, acoustic guitars... again, you get the idea! We even have an upright piano and an Eden mic at your service! - Musicians will perform between 7-10pm with a break in between. Looking for soloists, duo and trio acoustic musicians for intimate dinner music. Swoon us over with your blues, gypsy jazz, singer-songwriter originals... you get the drift! You get paid AND to keep all your tips from customers too. Bear in mind that business is running and we cannot be too loud - show off but never overbearing! - Musicians will perform between 10 pm - 1am with a break in between. Looking for duos, trios, vibrant and engaging musicians for a PARTY TIME. All genres are welcome. Sweep the crowd off their feet and unleash the fun! You get paid AND to keep all your tips from customers too (plus a couple of drinks per musician on the house). We have a 9 channel PA available for use. How do I get a gig at The Bebop? 1. Sign Up And Play! We hire bands for all of our prime time slots of course, but during off hours we feature a revolutionary system of busking with the opportunity to get hired! - Would you like to audition live? The Bebop has DIY sign ups all day. Get some stage time and audition for our prime time slots as well. - DIY sign ups are easy! We would love for our amazing community of artists, musicians and students to have a great place to perform that is as easy as DIY! These DIY booking slots are tips gigs as well so you can make a few bucks too! - This DIY booking is a great way to get out of your apartment and play some music live! It's also a fast way to get on our radar for our night time prime time booking. 2. Send Us Your Web links. If you're not local, you know you can bring a crowd to us as well as crush our crowd, please do send us your press kit. - The Bebop is now hiring acts from 7pm to 10pm (all ages), and 10 pm to close (21+). - For 7 to 10 pm we're looking for any Acoustic Music. From 10:30 to close we're flexible but we're looking for up beat bands; Americana, bluegrass, pop,... etc.. but up beat for the night crowd! Please do not sign up for more than 1 spot at a time!!! Respect our description of what we're looking for! SIGN UP BELOW for a 40-minute slot. Looking for 1-3 acoustic musicians for the afternoon crowd. Swoon us over with your blues, gypsy jazz, singer-songwriter originals... you get the drift! Best of all, you get to keep all your tips from customers too. Bear in mind that business is running and we cannot be too loud - show off but never overbearing! 1-3 acoustic musicians for the afternoon crowd. A mix of acoustic covers and originals from Northern CT.
Piano-bar style, request-centric set from all genres with the occasional original. Pianist and vocalist Elizabeth Hull brings a night of alternative blues to the BeBop. Her fun loving persona and unique voice are sure to soothe the evening ear. Girl + guitar. Original acoustic music! Girl and guitar - original acoustic music! Lina Cooper is indie songwriter performing originals and covers with an acoustic set of guitar(Cameron Mee) and bass(Miles Waldman) for the first time at the Bebop. I'm Priya and I'm a singer. I'll be performing a few jazz and pop tunes with a pianist. Fourteen year old jazz pianist Aleksander Xhoja plays Jazz standards and his own original compositions.